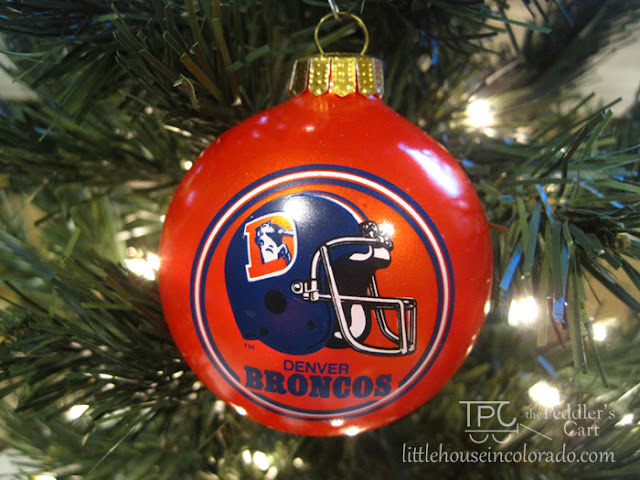 Last year while thrift shopping, I ran across this great vintage Denver Broncos Christmas Ornament. I loved the bright orange-i-ness of it! 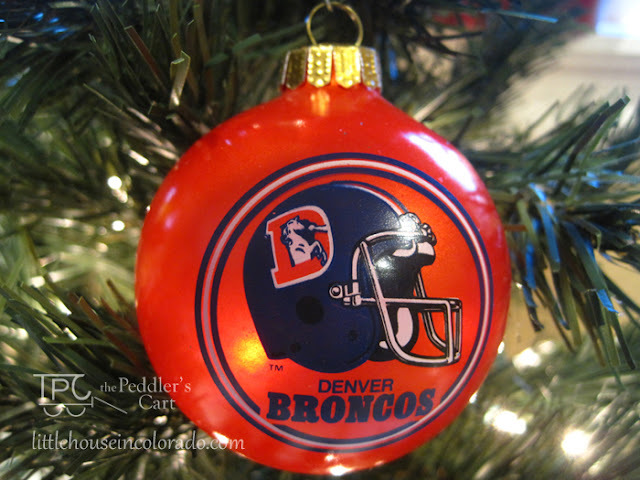 And while a part of me wanted to keep it (it IS a Broncos ornament, after all), I listed it in our vintage Etsy shop, thinking "well, IF it doesn't sell, THEN I'll keep it." That Christmas ornament sold really quickly. I'm kind of wishing I hadn't let it go :) I'll have to be on the hunt for another. ...and an LA Lakers ornament. And both still had their boxes (though the boxes were pretty worn) so I could get some details as to their origin. 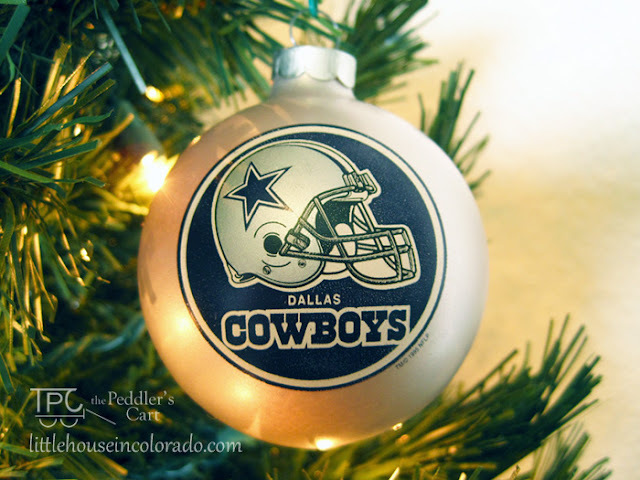 All of these ornaments are “Sports Collectors Series™”glass ornaments made by Topperscot Inc., in Denver, Colorado (circa mid-1990's) and are official licensed NFL & NBA products. These were both listed in our Etsy shop. 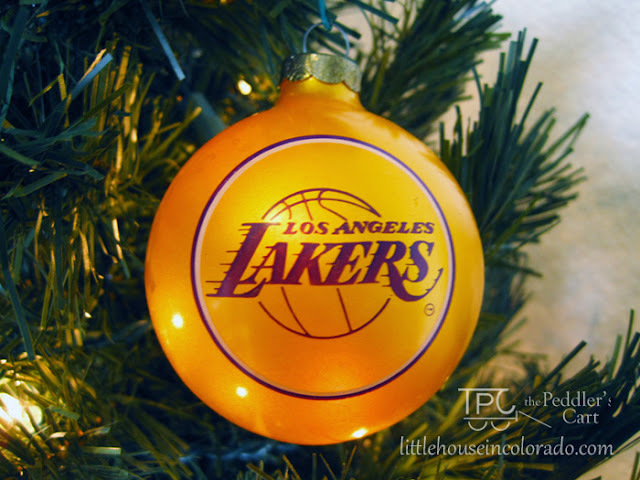 The Los Angeles Lakers ornament sold before I could post here either ornament (you can get faster notifications about new Etsy listings on our Facebook page). 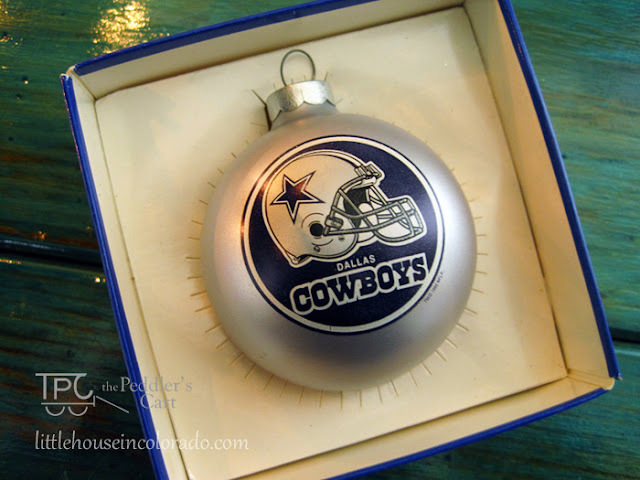 However, as of the date of this post, the Dallas Cowboys ornament is still available. If you want it, you can still have yourself a merry NFL Christmas this year! WOW! We just came across this HUGE book of DC Comics Super Heroes (and Villains) iron-on transfers! These would be great for a DC Comics fan! There are pages and pages of transfer designs ready for t-shirts, bags, pillows and more! Just looking through this book makes me want to watch the old Batman cartoons again. You can find this and other craft books in our Etsy shop! The Girl wanted to be Roy Mustang for Halloween this year (from the "Full Metal Alchemist" anime series) and then produced a photo of this elaborate military uniform and explained everything involved. She said it would also be for cosplay after Halloween so the materials needed to be of higher quality than if it were "just" for Halloween. (in hindsight, it would have been faster, easier, less stressful and probably cheaper to have just purchased the actual cosplay costume). First she learned how to sew straight stitches on the sewing machine. We also found several uniform shirts of the same color blue on sale at the thrift store that could be pieced together. We also found a pair of blue pants from a set of scrubs that fit her. All of this was done in August...plenty of time to get the costume completed. The sewing machine sat on the dining room table through the middle of September. When I mentioned it needed to be used or put away, she said she'd sew it by hand if need be. She never wanted to move beyond just sewing straight stitches on scrap fabric. I think the machine, with it's fast moving needle, intimidated her a bit. In late September, I did see her work on pulling apart seams and piecing the fabric together. We needed ribbon to trim the jacket (wouldn't paint work instead?). Cord to loop around one arm (pretty sure I have some yellow yarn we could braid into rope). Stars for the shoulders (I was thinking felt cut into star shapes...she was thinking metal stars...we got yellow star patches instead). White gloves (we both agreed to go with thin white knit winter gloves, $1 at the craft store, instead of dressy gloves). The weekend before Halloween, I was getting a bit nervous about whether she would have it done in time. But Sunday night she walked downstairs in her almost-finished Roy Mustang costume...and it looked GREAT! She was more than ready when Halloween arrived! She looked fantastic! I'm sure it won't be long before she dreams up the next costume to make. Serve this warm, cheesy Savory Party Bread at your next gathering! 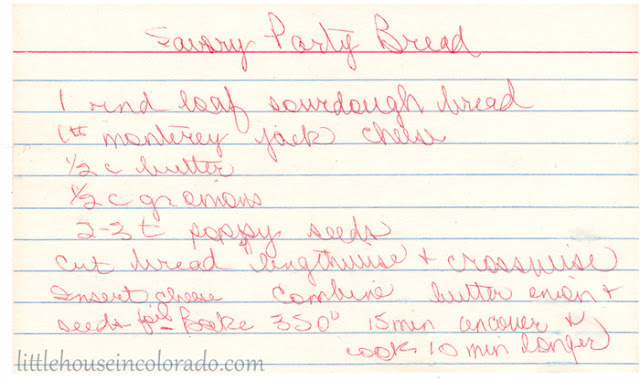 This recipe was handwritten on an index card. It was found in an old large recipe file box. The age of the recipe card is unknown.